with study planning lying at the heart of it. 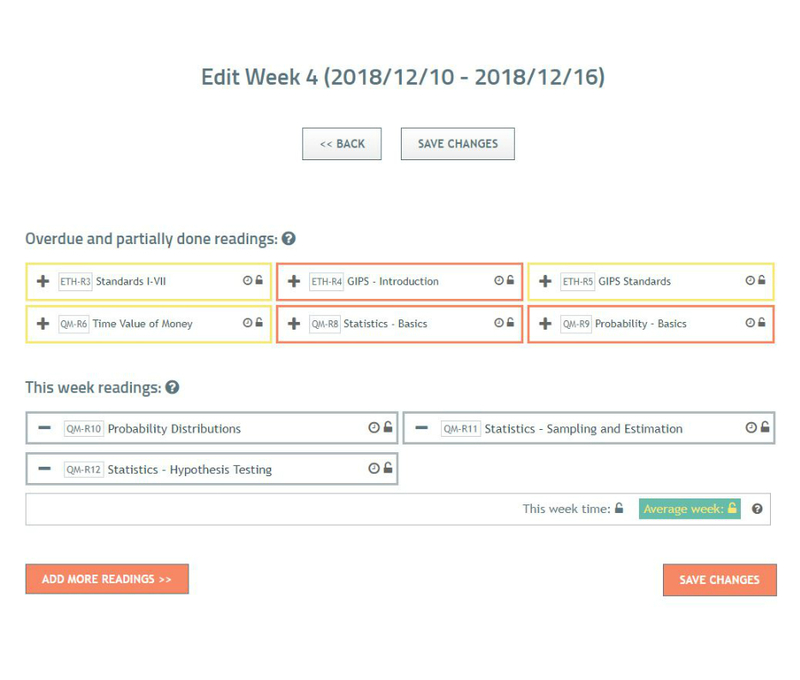 Create Free CFA Study Plan. 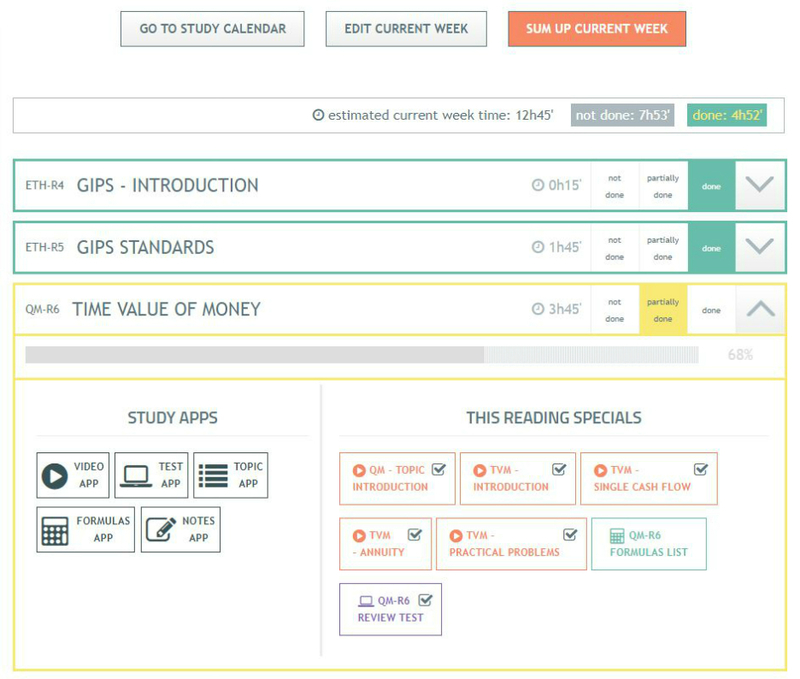 Get So Much More >> Create Free CFA Study Plan. But before we made it happen, we spent 10 years teaching people finance and observing how they learn. When starting our professional activity in education, we were naive enough to believe that our students are all finance freaks who would just study and never stop until they pass their exams. But soon we found out that’s not how it works. There were all sorts of students: with the overconfident and ignorant at one end of the spectrum and the anxious or unsure of their abilities on the other. But what was common about them all was that these were not abilities they lacked. Their success always depended on their attitude. on hard skills development only. They teach you how to calculate the IRR. They tell you how to manage a portfolio. But they never explain how to cope with your exam preparation as a whole. We set about to change that. As we watched our students, it was becoming a sure thing to us that the holistic approach is needed here. Too many smart students failed ‘cos they didn’t know how to cope their preparation process, not CFA study content. It is clear to us that they would have succeeded if their CFA exam prep hadn’t been uncontrolled, unexecuted, and unproductive. This is why we devised this exceptional growth attitude to CFA exam prep with CFA study planner at its core. truly learn while you study. We have no doubts this is the right way for your CFA exam prep to be successful! Yet, what CFA candidates seem to care about most is still just some study materials and sometimes a study plan. So, that’s what they get... To be frank, we’ve been there too. Just offered some study materials and a simple study plan app. But we figured topic deadlines are not enough. Nor are videos and tests. As we gained experience in the field of exam preparation, we could no longer pretend we knew nothing about CFA candidates’ pains. While we do. We know it’s hard to control your exam prep with all the work, family, and activities you have. We know your motivation is the worst in the middle of your prep when most of studying should happen. We know you study but then remember next to nothing. But thanks to the growth approach for CFA, you can have a successful exam prep. All it takes is weekly control, maintained motivation, and regular review. All the tools are there for you inside your study plan. We did the best we could to give you all this (and are still developing our approach and this portal). Now, it’s up to you to decide how much of it you’d like and need for yourself. 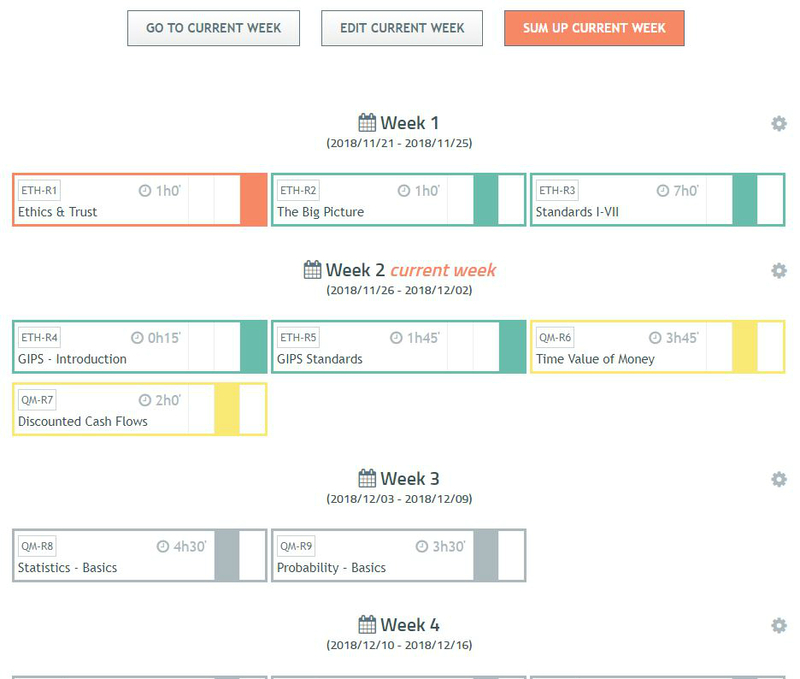 and a CFA study plan that finally WORKS (and works great)! This is our story: Growth – both yours and ours – in all aspects of CFA exam prep! Create Free CFA Study Plan. Start Growing Create Free CFA Study Plan. Don’t hesitate to spread a word about it. The only harm the growth approach can do is highly benefit its followers . PS. The growth approach takes some time and effort. Sometimes you may feel it demands too much of you. But we promise – live up to those demands and you’ll see how grateful (and satisfied!) you’ll be in the end.